I have been to Australia and New Zealand a few times. Here is a report on my latest trip: I have not been to New Zealand for a few years. The distance and time out of the office usually stops me from considering it. This year, though, I decided that a revisit was necessary. I am so glad that I went. There is nothing like flying to NZ from LAX on a flat bed on Air New Zealand. I was so delighted with myself that I did the upgrade. Arriving refreshed certainly helped me to get over my jet lag. They say it takes a day to recover from jet lag for every hour of time difference. I didn’t experience anything that extreme, but it did take 4-5 days for me not to fall asleep at every opportunity during the day. I had not visited Waitomo (about 3 hours south of Auckland) previously. I am a bit claustrophobic, so traveling to an underground cave was not at the top of my list, bit this was different. 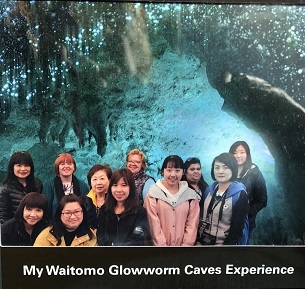 The glow worm caves at Waitomo felt open and well organized. The tour starts with a walking tour through the main cave with a Maori tour guide, and concludes with a trip by boat to the end of the cave. Our guide steered the boat in the dark with the aid of overhead ropes, and he was skillful in avoiding the walls and guiding us through the twists and turns of the caves. That' me in the center back row. We continued on to Rotorua, the center of the thermal region on the north island. I stayed at the Novotel, overlooking the lake, and just across the way from Eat Street, a street long selection of restaurants of every type. We ate at Wild Rice, a Thai restaurant. GREAT! The next day was the highlight of my visit to Rotorua – a day of new adventures and exclusively for its sheep shearing demonstration and many breeds of sheep. This time, though, I tried both jet boating – traveling at the speed of a Ferrari – great fun, and flying. Flying – not in a plane, but dressed in a flight suit, being shot into the air by a giant fan. I was surprised at the force of the fan, which easily lifted me up about 10 feet above the ground. I did look like a Telletubby, but I am proud of myself for trying it. 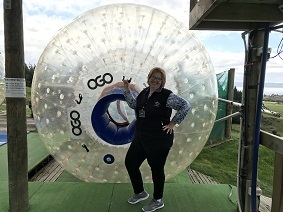 Ogo – you may know it as zorbing – rolling down a hill in a giant sphere. There are two types – in a sphere with water, where you travel from side to side and are generally thrown about, or the more gentle, dry ogo, which is a simple roll down a hill in one position. I opted for the latter, and it was fun – and every easy, not at all scary. It’s hard to describe a day which has so many highlights, but lunch was at Te Puia, a native Maori village. The thermal pools are used to steam food, which resulted in tasty corm and soup appetizer, followed by an exclusive lunch beside the geyser. Dim sum steamer baskets were filled with lamb chops, dumplings, a sweet potato-like vegetable and other delicacies. Just wonderful! They geyser went off like clockwork as we dined. 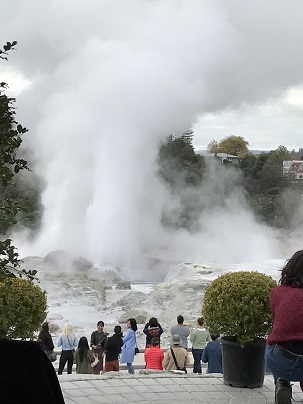 You could easily spend a day at Te Puia, watching the carvers, weavers, and experiencing a welcome ceremony and singing, and seeing the thermal areas. Sadly we just had a 2-3 hour visit. The thermal pools are used, too to fight arthritis and other aches and pains. The Polynesian Spa is the best! Back in Auckland, and having seen the usual sights, I took a few minutes ferry ride from the bottom of Queen Street to Devonport. For $12 NZ (about $6 US), I was transported to another time, where you can easily picture what life was like in the early 1900’s. A walk along the main street past traditional shops, and converted building like the old Post office, which have been transformed into trendy places. The harbor is great, and the colonial houses are interesting, too. I stayed at the Stamford Plaza Hotel, a 4 star property in the heart of it all. Nice, large rooms, a good pool and gym, and a buffet breakfast included everything I wanted here. A taxi to the airport cost $75NZ (about $40US), not bad for a 40 minute trip on a good day. 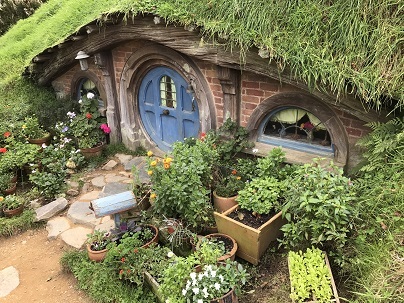 Hobbiton – We visited the Hobbiton Movie Set, the setting for The Shire that featured in the Peter Jackson directed films, The Lord of the Rings and The Hobbit Trilogies. It’s a charming village with hobbit doors set into the hillside, a mayday pole on the village green, and quaint pubs and restaurants. It was well worth the trip. The second week - the south island. The drive from Christchurch to Oamaru is about 3 ½ hours , and is a good stopping point on the way from Dunedin to Milford Sound. 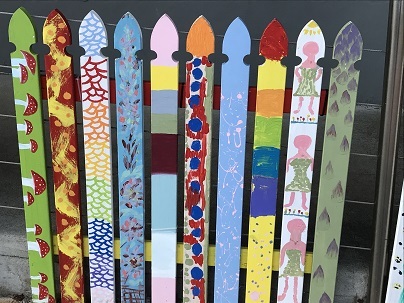 Oamaru - a funky Victorian Tour with a Steampunk Museum, farrns, and more – and we did that all in a day. You could easily spend a few hours shopping the Victorian shops along the main street or an hour exploring the Steampunk HQ. We ate at a craft brewery in the town – a fun experience too. The newly opened Whitestone City had everything from Victorian times, from table games, a penny farthing carousel (high bikes). Later, we visited a Victorian farm just outside of town where we fed the sheep. The highlight of our arrival in Oamaru was watching hundreds of blue penguins come ashore. 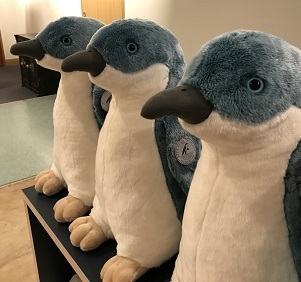 Each is about 16 inches high, and they are blue. They come up the beach in droves (or rafts) 10-50 at a time at the Oamaru Blue Penguin Colony.. I was given a certificate showing that I adopted penguin number 36567, so when you go look for him. They are noisy birds, living in habitats overnight on shore and going out to see again in the morning. An easy drive to nearby Omarama (not to be confused with Oamaru) includes the prehistoric looking landscape which was the setting for the film, Narnia. Nearly, the rocks really look like a herd of elephants. In the Nature center in town, we looked for fossils in the limestone rocks. You could easily spend a day here. 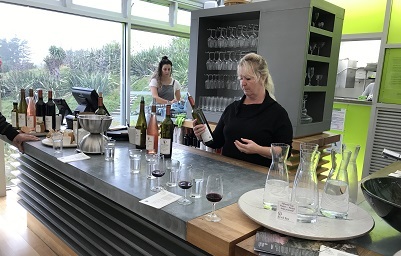 The Kurow winery was a short drive away, and we listened to the Italian winemaker talk about his wines. They had just completed the harvest so there were picked grapes everywhere. Another winery, another day. The wine was delicious, though. 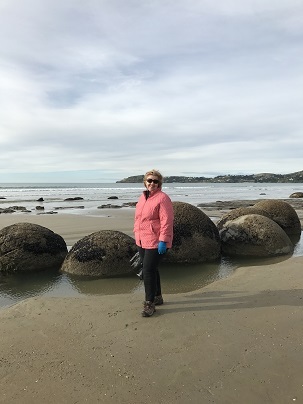 The Moeraki boulders are located on a very interesting beach. The boulders are complete spheres, about 4 feet in circumference or the largest ones. They were not formed by erosion from the waves, but were imbedded in the sandy hillside and fell to the beach. Remarkable! 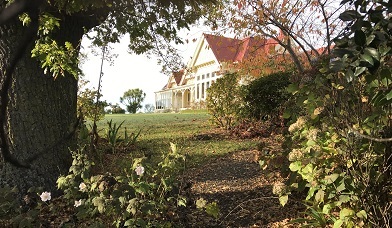 Visiting Pen-y-bryn Lodge. In Oamaru reminded me of being in the UK – The name is Welsh (top of the hill), and its original occupants were Welch. It is a lovely 4 bedroom boutique type of hotel (called a lodge in NZ), tastefully redecorated by its New York owners. All in all, my trip to New Zealand was eye-opening. So many exciting adventures, beautiful scenerey, lovely people and great food. I can't wait to go back!